I have Jamie Oliver to thank for this recipe – Every.single.time I have used his recipe they have come out brilliantly. All I have done is swap the milk for soy milk et voila! 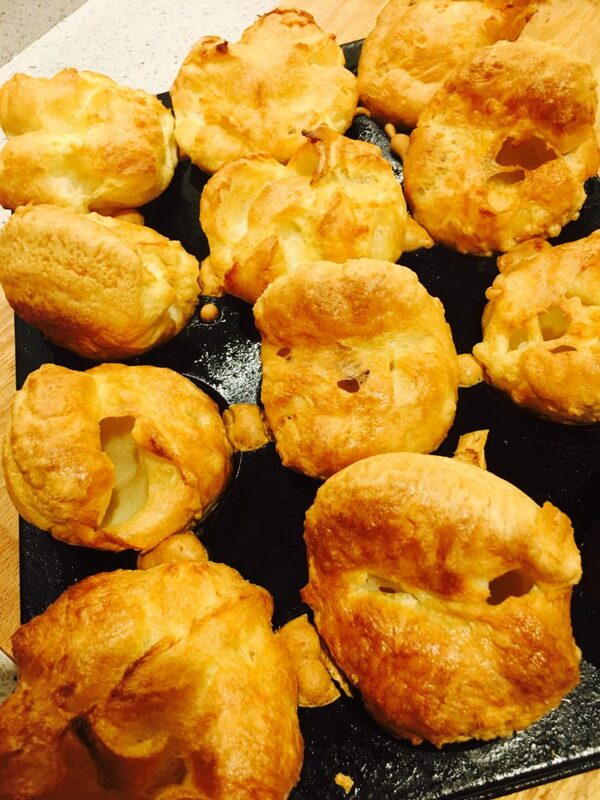 12 beautifully puffed up and fluffy yorkshires! Turn the oven up as high as it can go. In a jug beat together the eggs, flour, soy milk and salt until the mixture is smooth. Grab a 12 serve muffin tin and put a 2 tsp of oil in each one. Once the oven is up to temp put the tin into the oven so that the oil can heat up. After about 5 mins take out the tin. Shut the oven door! (the oil should be piping hot so be really careful) pour an equal amount of batter into each section. Try and work as fast as you can. Put the tin back in the oven on the middle shelf and close the door. DO NOT OPEN THE DOOR FOR 15 MINUTES. After 15 mins turn the temp down to 150degrees and leave for a further 10 minutes. After the 10 minutes is up take the puddings out of the oven.